A big reason we collect cars is because there is an emotional attachment. Mine for AMC, and Jeeps, coming from my dad working at American Motors. 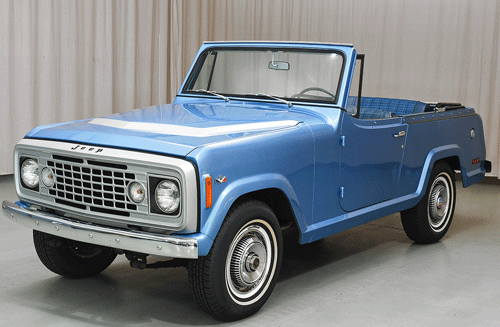 AMC bought Jeep from Kaiser in 1970. 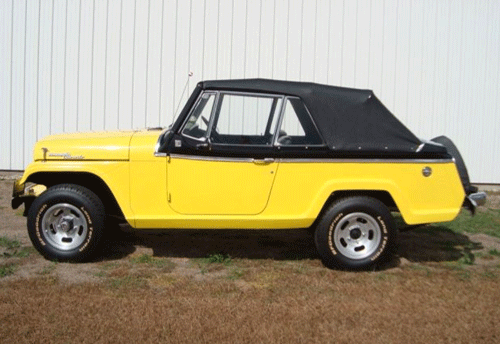 My favorite Jeep is the Jeepster originally produced by Willys-Overland from ’48-’50 and then ’66-’73. A vehicle so popular T. Rex wrote a song about it. Later named the Jeepster Commando, it was designed to compete with the Ford Bronco, International Scout, and Toyota Land Cruiser. Buyers could get it as a pickup truck, convertible, roadster, and wagon. I like the convertible best. After AMC bought the Jeep line sales started to get popular. Originally on a 101″ wheelbase, AMC lengthened it three inches, shortened the name to the Commando C104, and gave it a new grill that made the Jeep guys (and gals) go crazy since it wasn’t the traditional seven slot grill. The design was done so AMC I-6 and 304 V8 engines would fit. Not my fav either. Turns out the general public wasn’t buying it either and the line came to an end. What’s the saying, one door closes and another opens? AMC replaced it with the two-door version of the Wagoneer and named it the Cherokee. 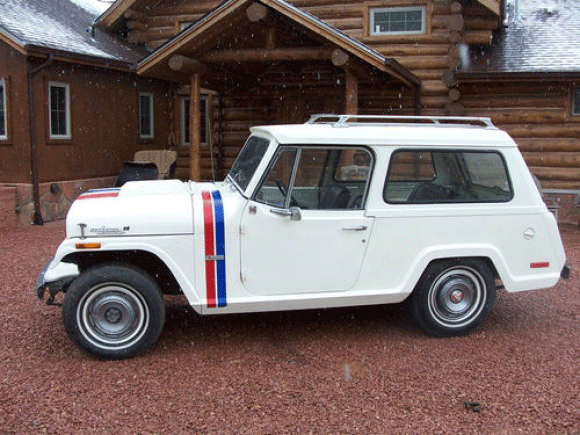 The Jeepster is an affordable vehicle from a collection standpoint. Good examples can be picked up for somewhere in the middle 30’s and there are tons of parts available. While Jeepsters can be found easily, you would have a tougher time finding a Hurst Jeepster because it was only built one year, 1971, and there were only 100 copies assembled in Toledo. 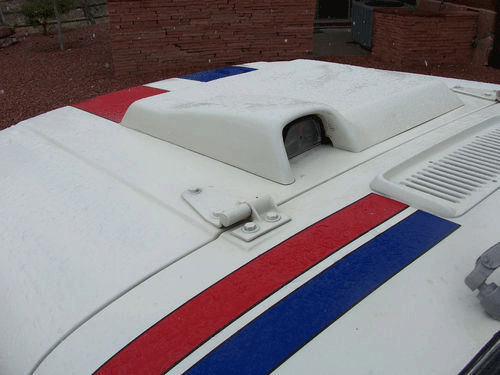 Similar to AMC’s Hurst Scrambler and Rebel Machine, it came in one color, Champagne White with red and blue stripes, a special exterior insignia, 8,000-rpm tach on the back of the hood scoop, as well as a Hurst T-handle shifter. I saw one on a Velocity TV program (I spend way too much time there) and the guy said he would not part with it for under $100,000. Enter Tonka created in November, 1955. The name comes from the Dakota Sioux’s word “Tanka” or Tonka, which means “Great” or “Big. 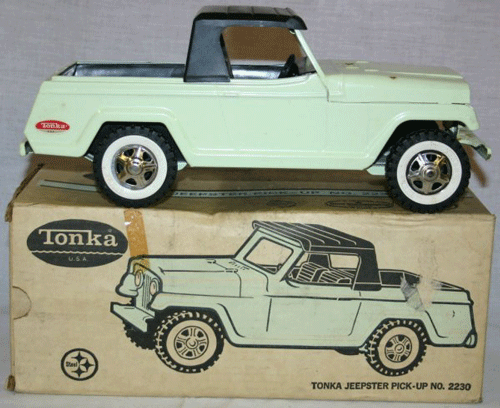 Tonka’s specialty was trucks, mostly construction equipment models like dump trucks, cement mixers, tow trucks, and more. The models were made out of stamped steel earning them the reputation to being almost indestructible which is why have become collectible. 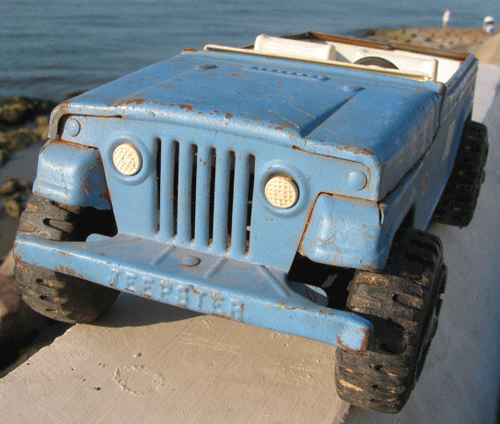 Besides the construction vehicles, they also manufactured Jeeps, like the Jeepster. Tonka also made some passenger cars like the AMC Pacer. Had to throw that in. Similar to their full-size counterparts, the Tonka’s also have a following and you can buy them mint in box for around $350 (left image), or you can buy a restoration project starting at around $10 (right image). They are made out of metal so you can sand, fill, paint, plop in a new interior and boom, your project is done for around 50 bucks. Then you can flip it and go onto your next project. I’ve been thinking about doing that, still thinking, and thinking, and it always comes back to my theory, the cash-time continuum. So if you imagine a large pie chart, maybe two of them. In one of them is all the things you love to do, like cars, or planes, or golf, or whatever. Each one is allotted an assigned amount of time in the pie chart. Same deal with cash assigned to each hobby. So now you want to do something new. Well, in my theory, if you want to add something, you’re going to have to give up something else, right? Damn, I wish I hadn’t come up with that.